Raccoon Removal or Raccoon problems in Darien, Illinois. Situated at the far southeast corner of DuPage County, the City of Darien’s motto is “A Nice Place to Live”. The raccoon population in Darien couldn’t agree more! Darien has a vibrant park district with green space totaling over 130 acres. Darien also boasts Carriage Greens Golf Club along with Bruce Lake. These natural areas provide quality habitat for Illinois varied wildlife species, including the “masked bandit” raccoon. Raccoons often manage to find ways into attics and underneath decks, often causing costly repairs. Nuisance Wildlife Control has been servicing the Darien area for over fifteen years. We have the experience to capture, remove and prevent unwanted animal intrusions into your home. Contact us immediately at (630)416-9920 or simply use our appointment scheduler if you are experiencing a raccoon intrusion. Mother skunks mate in late winter and will raise their many baby kits next to or under your porch or sidewalk. Skunks are most noticable in spring when they excavate their dens around concrete porches and stoops. Often times a homeowner will notice a softball sized hole by the front porch and not pay much attention to it until it’s too late. Skunks are diggers and routinely seek out these places to den up and have their young. At Nuisance Wildlife Control, we are experts at trapping and removing skunks from your Darien, Illinois home. Contact us immediately at (630)416-9920 or simply use our appointment scheduler if you are experiencing a skunk intrusion. Darien is squirrel paradise. With its abundance of tree lined streets, golf courses and community parks, Darien provides all the necessities for a healthy squirrel population. Squirrels can find their way into your home with just the smallest opening. Once nested inside your home, squirrels can have two litters per year. Often they build their nest within wall cavities. Acrobatic tree climbers, squirrels will often gain access to your home via tree branch “bridges”, then chew their way through the roof fascia and enter your home. Squirrels will destroy attic insulation while building their nests. Contact us immediately at (630)416-9920 or simply use our appointment scheduler if you are experiencing a squirrel intrusion. Brown bats are plentiful in the area. But, sometimes they will end up in house attics or even the soffits. These protected little mammals are evicted with non-lethal expertise and efficiency. If you need bat eviction in Darien, Illinois get a hold of us by phone or e-mail right away. Successfully completed skunk trapping and removal in Darien. IL. 2 skunks removed from under concrete porch. Raccon and skunk trapping and removal in Darien , IL. Trapped 1 skunk overnight and have reset trap . 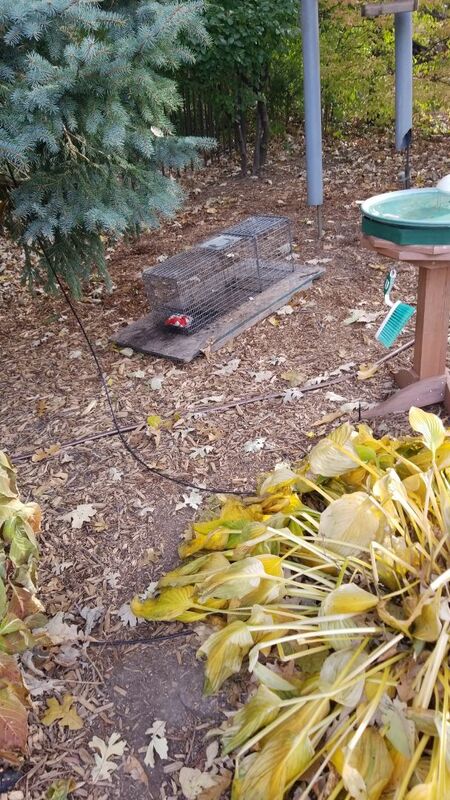 Successful professional skunk trapping and removal in Darien , IL.